Imagine a day consisting completely of culinary experiences. You begin with your favorite coffee-based beverage and a savory breakfast sandwich. For lunch, you nosh on a fresh salad featuring a fine selection of olive oil and balsamic dressings. At dinner, you take a cooking class and then end the night atop a balcony with a cheese tray and a wine glass in hand. This sounds like a foodie’s fantasy, but it’s a reality at The Bodacious Family of Shops in Pensacola. In bringing the Blue Wahoos baseball team to Pensacola, Quint and Rishy Studer knew they also wanted to enliven downtown. The couple purchased two buildings on the busiest intersection in downtown Pensacola, knowing only that it would become a retail space with all profits benefiting community projects. The shops and restaurants the Studers added have no doubt contributed to Palafox Street being voted one of the top 10 streets in the United States. A stunning, architecturally awarded staircase leads guests up and down to cuisine-centric options. The Bodacious Olive, an epicurean market featuring olive oils and vinegars, allows guests to dip a variety of gourmet products to their hearts’ delight. Rishy Studer soon came to realize that their tasty oils could be utilized in multiple ways. So Chopped Salad Bar & Bistro tosses fresh and healthy salad options with a plethora of toppings and oil-based dressing options. Rishy believes that every good downtown should have a coffee shop. So she opened The Bodacious Brew, which boosts any day with gourmet coffee and tea options — but they don’t stop at liquids. Hearty breakfast sandwiches, quiches, wraps, pizzas and more are available there throughout the day. If you like being your own chef, So Gourmet Kitchenry is a treasure trove of gadgets, utensils and gifts. If you want to test your skills or concoct something new, cooking classes and demonstrations are hosted in the Culinary Instruction Kitchen. 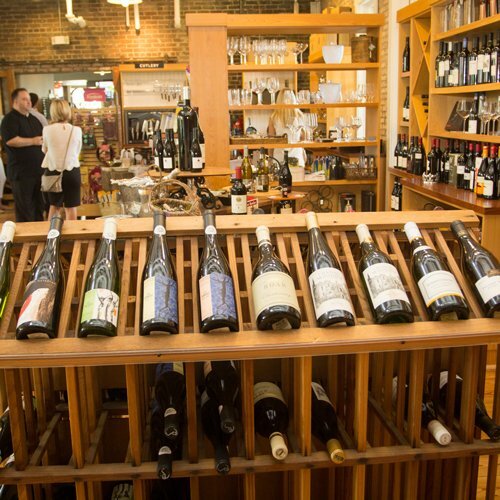 The Wine Shop and Cheese Counter tantalize your taste buds through perfect pairings. Gather your best gals for a cooking class, have a romantic date night with wine tastings or simply find a cozy spot to yourself at the coffee shop. “People come for the good, healthy food options, which I’m very proud of,” said Rishy.